Do you have lots of plants to be potted? I spend quite a lot of time every year planting different pots of flowers, herbs, and potted vegetables. 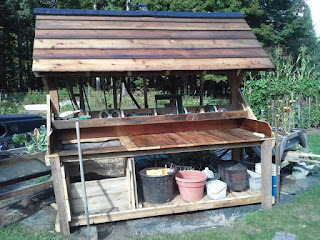 With potting bench, potting plants will not be a messy experience and back-breaking work anymore. I was tired of bending over on the ground or using the picnic table for planting in pots. I haven't even looked at any plans but I came up with a solution. 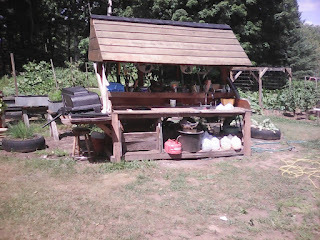 My potting station; I called it. 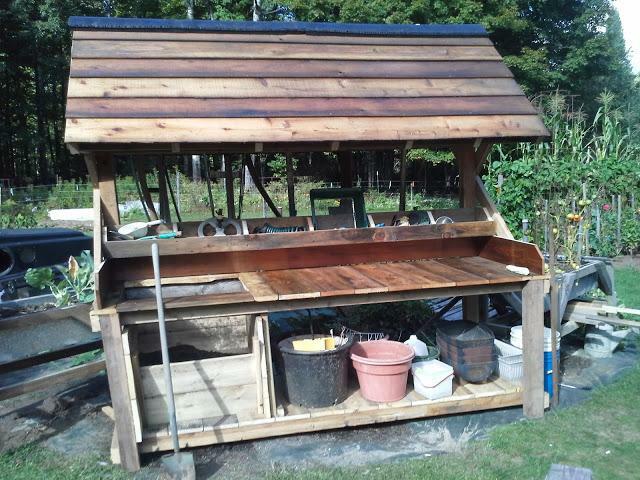 A potting bench will give you extra room to pot plants and flowers as well as keep your gardening equipment. 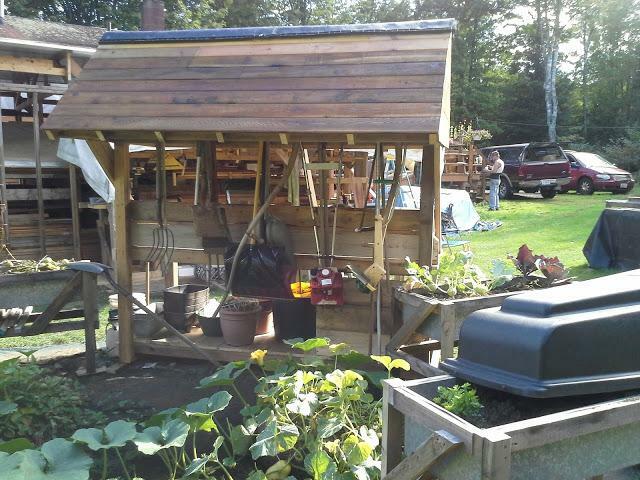 Even if you love gardening, repotting plants or dividing flats can feel like a real chore if you have to scavenge for supplies in the dark corners of the garage. Park them on a dedicated workstation, however, and you'll never waste time hunting them down again. If you plan to leave it outdoors, make sure you build it from cedar or exterior-grade lumber. An indoor bench should get a weather-resistant finish, at the very least, to prevent water, soil, and fertilizer from damaging the surface. And for those of you who don't want to DIY this project, we have good news: There are potting benches on the market that suit all budgets. Just make sure the one you buy has a work surface at a comfortable height for you. Once you start using it, you'll wonder how you ever did without this. 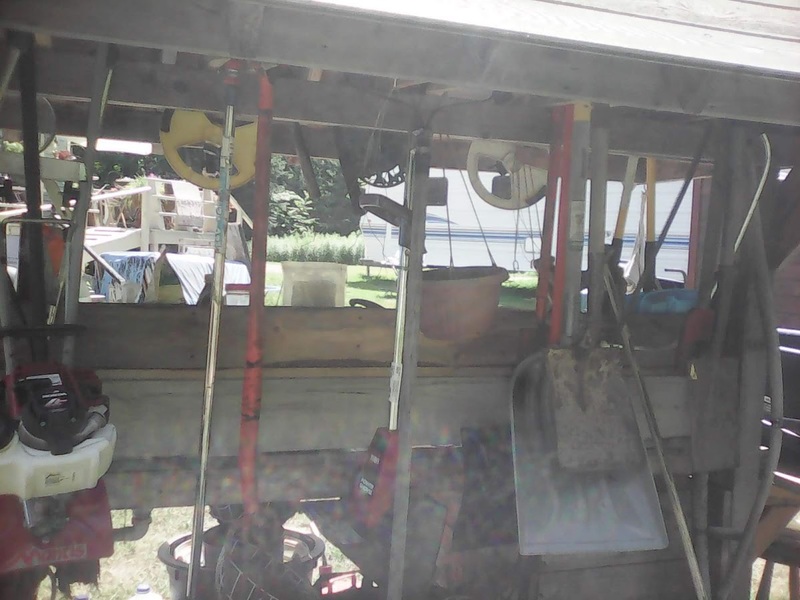 And the bench also has overhead storage. That is a great feature because when you are done you have extra places to store your pots and other planting nick-knacks. The sky is the limit when coming up with a design. You can make them fancy or what I like is rustic to blend in with the garden. 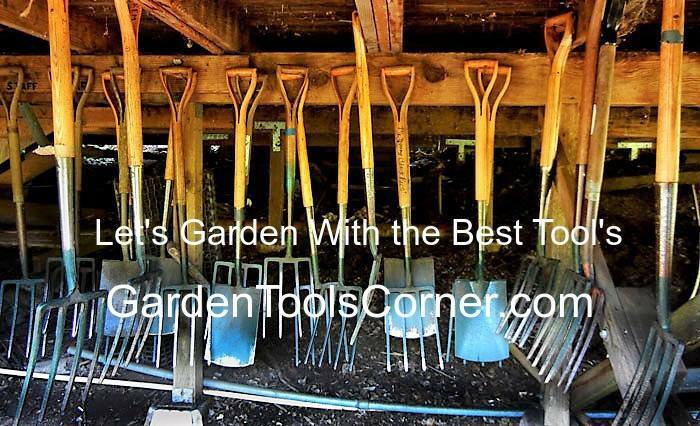 It is a great place to store your garden tools and keep them out of the rain. 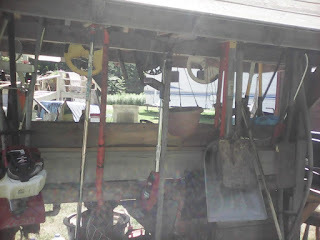 For lots of ideas go to https://morningchores.com/potting-bench-plans/ You will find one to suit your needs.